French style quilts and coverlets plus blankets and throws. Classic and country. A Renaissance-inspired pattern on rayon velvet. Cotton fill. 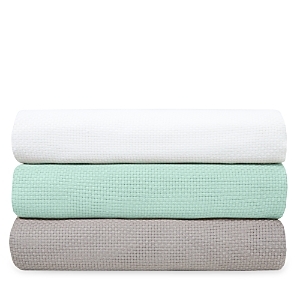 Whether you layer them with your own linens to add texture and color or use them on their own, you're sure to love these linens. Set includes one quilt and one sham. Cotton. Machine wash. Does your bed need an extra layer of warmth, texture, or color? Quilted with stripes and finished with a mini ruffle, Battersea linens may be the perfect answer. Cotton/viscose velvet with diamond quilting. 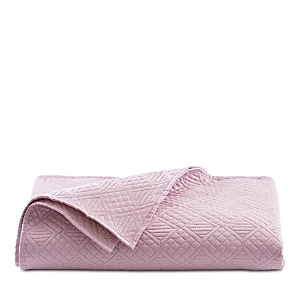 Machine wash. Coverlet made of polyester/cotton with diamond quilting. Sham made of polyester/cotton with diamond quilting. Teardrop-textured bedding with 1" flange finish. Polyester/olefin front; cotton/polyester back. Duvet cover made of silk/rayon/polyester. 90" x 95". Dry clean. Made in the USA. Mix and match to create a unique bedroom style with the Zilara coverlet set from J Queen New York, featuring a variety of coverlets, pillows and shams. Give any room a perfectly polished look and feel with the refined quilting and shimmering hues of this luxe Satinique bedding collection from J Queen New York. Coverlet and shams made of olefin/polyester with polyester backing. 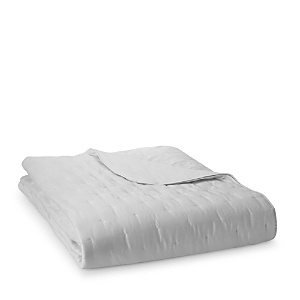 Sheet made of 200-thread-count Egyptian cotton. Rayon/polyester front. Polyester back. Featuring a stylized basketweave quilted design in luxe velvet, the Anne de Solene Divine coverlet layers beautifully with all sheet collections. The Cross Stitch collection makes the simple beauty of solid colors in an "x"- stitch texture perfectly blend your decor together as a modern stand alone look or as an accented layering piece. The Cross Stitch collection makes the simple beauty of solid colors in an "x"- stitch texture perfectly blend your decor together as a modern stand alone look or as an accented layering piece. The Levtex Home Cross Stitch Blue Haze Full/Queen Quilt Set includes one full/queen quilt and two standard shams in blue colors. The Cross Stitch collection makes the simple beauty of solid colors in an "x"- stitch texture perfectly blend your decor together as a modern stand alone look or as an accented layering piece. The Levtex Home Spa Pintuck Full/Queen Quilt Set includes one full/queen quilt and two standard shams in teal colors. Add texture and style to your bedroom decor with the lovely Spa Pintuck collection featuring an endearing design of small gathered knots that will make your decor look chic and unique. The Levtex Home Pom Pom Taupe Full/Queen Quilt includes one full/queen quilt and two standard shams in cream and taupe colors. Where sophisticated look and charming details come together, the Pom Pom collection is a perfect addition for a solid accent to your decor with a subtle trim. Featuring a classic quatrefoil stitching pattern, the Bordeaux collection is perfect for blending together the colors of your home decor. The Cross Stitch collection makes the simple beauty of solid colors in an "x"- stitch texture perfectly blend your decor together as a modern stand alone look or as an accented layering piece. The Levtex Home Champagne Velvet King Quilt Set includes one king quilt and two king shams in gold. The Champagne Velvet collection is a perfect addition to any gold glamour look or even as a touch of flair for your holiday look with a soft solid texture. The Adobe collection features a decorative border trim in natural colors that complement the subtle quilting pattern and bring a touch of modern elegance to your bedroom. Featuring a classic quatrefoil stitching pattern, the Bordeaux collection is perfect for blending together the colors of your home decor. Soft as silk, the Triomphe bedding collection from Yves Delorme is an expression of classic luxury. Crafted from fine Egyptian combed cotton with a luxurious sateen finish, the sheets, duvet cover and coverlet feature a raised double-saddle stitch border for an interesting accent Pure cotton is expertly woven with a rich waffle texture in a coverlet of simple sophistication from Yves Delorme. A global concept for the home, Yves Delorme elevates bedding essentials with luxurious materials and designs like the elegant Morphee coverlets available in two sizes. 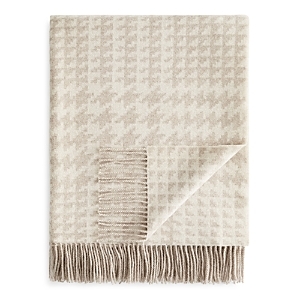 Give your bed an upgrade of style and comfort with the super-soft cotton and luxuriously textured woven chevron pattern of these cozy blankets from Vellux. Enjoy cozy comfort with the Micro Flannel® quilted blanket collection from Shavel, featuring a sophisticated stitching that lends elegance and style to any decor. This blanket does not pill and is wrinkle-resistant. 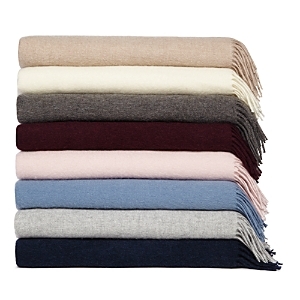 Sleep in warm comfort with this exceptionally soft Micro Flannel® to sherpa blanket by Shavel. Featuring cotton flannel on one side and super-soft sherpa material on the other, this is sure to be the cuddly must-have for cold nights. 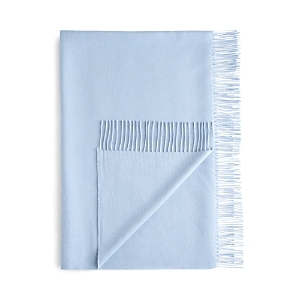 The exquisite softness of pure alpaca creates cuddle-up luxury in a throw from Yves Delorme woven in smart, sophisticated stripes with fringed trim. 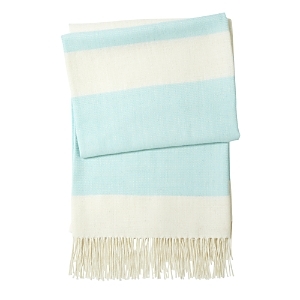 Ultra-soft and cozy, this luxurious Yves Delorme throw doubles as a blanket on chilly evenings. Handcrafted faux fur (acrylic) throw. 53" x 75". Handcrafted faux fur (acrylic/polyester) throw blanket. 75" x 53". Faux-fur (acrylic pile with polyester) throw. Faux-fur ostrich throw. Undertones of aqua blue. 54" x 72". Faux fur throw blanket. 53" x 80". Faux wolf fur throw. 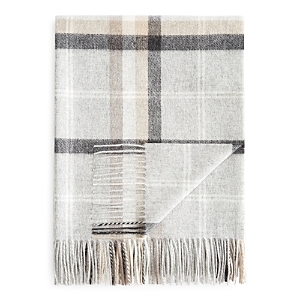 Faux-fur (acrylic) throw. Twisted cording edge. Throw made of acrylic faux fur and rayon/silk velvet with polyester lining. Dry clean. 48" x 72" Faux-fur (acrylic/polyester) throw in chinchilla pattern. Cotton/viscose. 68" x 96". 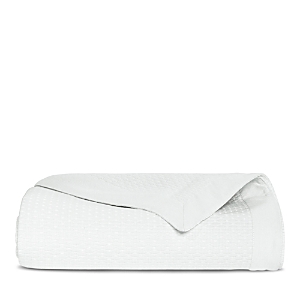 Machine wash. Add textures and style to your room with the versatile fleece throw from Lacoste Add the soft, relaxed comfort of the Caviar Color block throw from Lacoste Home, featuring the smooth touch of cotton and the brand's iconic crocodile logo.